It's been a bit since I've posted so I thought and appropriate topic would be what Cooper, Mommy & Brother and Daddy have been up to! Brother: Today we had our 20 week appointment on base. 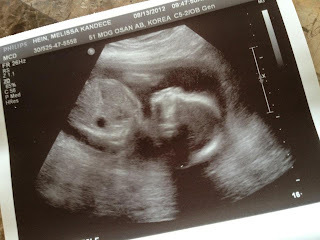 This is the only ultrasound given throughout the pregnancy here on Osan for non-high risk pregnancies. The good news is everything looks perfect and our baby boy will arrive at Christmastime. The exact due date is 12/28 but they deliver C-sections on Osan at 39 weeks which puts our new due date of 12/21. This works out great as it should put us at home for Christmas! Owen and I have a long list of names on our chalkboard with votes and vetoes - hopefully we can come to a decision in 19 more weeks! Work: I've always been aspirational in terms of my career so my new role as SAHM has been challenging although being with Cooper has been amazing and I don't see how I could ever give that up. I've struggled the past several months trying to find my place in this new role. I quickly picked up the publicity and webmaster chair positions for the Osan Officers' Spouses' Club and logged 60 hours my first month working on rebranding the organization and I'm looking forward to utilizing my experience to help advance the organization over the next year. My delay in posting is due to spending Cooper's nap times working on OOSC publicity and web jobs including writing a marketing plan for the year, marketing for the new OOSC cookbook, writing a new sitemap, updating the OOSC website, migrating and updating the OOSC FB page and just a few more OOSC things! I still needed another outlet that would allow me to interact with clients and friends and after much research and soul searching (and need for candle options in Korea) I decided to start selling Scentsy. I started my Scentsy business online and my first party is next Monday - I couldn't be more thrilled! Stateside visit: I've been really homesick for family and for the states. Especially after the friends I made in the first few months left the country permanently for new assignments and many other friends left for stateside to visit for the summer. The permanent moves included the blog's infamous Aimee that was included in most every blog entry from March through June! Didn't realize how difficult that would be but it truly has been hard to have her missing from the Osan landscape. Miss you Aimee! I've also been living out of my suitcase at my own home for the past 4 weeks waiting for a Space A flight to visit family. The flights leave on Tuesdays and Thursdays and we haven't made the standby list yet. This is our last week to try for Space A - either way I'll just be happy to unpack. Our little boy is getting taller and smarter by the day. It's quite fun to watch him learning new things. and more words from March and May. On the playground - Last week Cooper saw a group of older boys climbing the tops of the playground equipment and sliding down and a lightbulb went off that he could go to the big slides too - so now that's his preference. Gives me a heart attack every time but he loves it. Big boys, trains and cars: He loves the big kids and especially the big boys. He loves trains and cars. He's all boy! Movies and TV: Only last month did he start to really love watching TV and movies. So, where the TV had been background noise now I have to be careful about turning it on so he doesn't zone out. His favorites are Sesame Street, Elmo, Thomas the Train and Despicable Me (including the Minion Madness shorts). Sleepyhead: Cooper is still a great sleeper - going to bed around 8:30p and waking between 8 and 10am. He naps exactly 3 hours after he wakes for 2-4 hours and just last week he started skipping the afternoon nap. 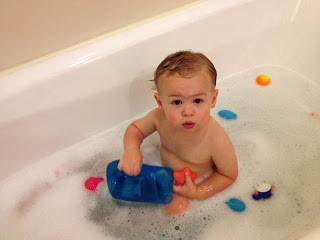 Water: Cooper LOVES water any place - the waterpark, water fountains and bathtime! Owen put on Major in June and quickly earned his keep by working some crazy hours throughout June and much of July (due to a high PCS of squadron members leaving Korea). Now that four new airmen are trained up the hours are starting to normalize a bit. Owen's also been hard at work watching the Olympics and doing his own Olympic-style workouts in the pool, on the track and in the gym. And he still insists that he has the best wife and son in the whole world and couldn't be happier to add baby #2 to the mix! We're also excited to vacation in Thailand in October and posting about all of the great adventures we've had and will have here in Korea! Very exciting! Congrats again. Looks like you have a full plate, friend.